The coactive aesthetic is one that focuses on the interaction between the observer and the observed. The aesthetic is in the interaction between these two entities and is not manifested entirely in either. Furthermore, for the interaction to be considered coactive there must be qualities of this interaction that go beyond simple deterministic responses by the object to the viewer. nature of that influence. This means the object must have a certain level of autonomy in its behavior and the behavior must not be totally or trivially determined by environmental (sensory) inputs. We achieve this coupling of viewer and object with computers, sensors, and various computer-controlled devices. The real power of the computer as an artistic medium rests in its ability to respond in real-time to events in the world. Other uses of the computer may enhance different media but they do not constitute fundamentally new ways for aesthetic expression. Thus we are not proponents of electronic or computer art that highlights the technology for its own sake. We attempt to down-play the technology used to bring our pieces to life. 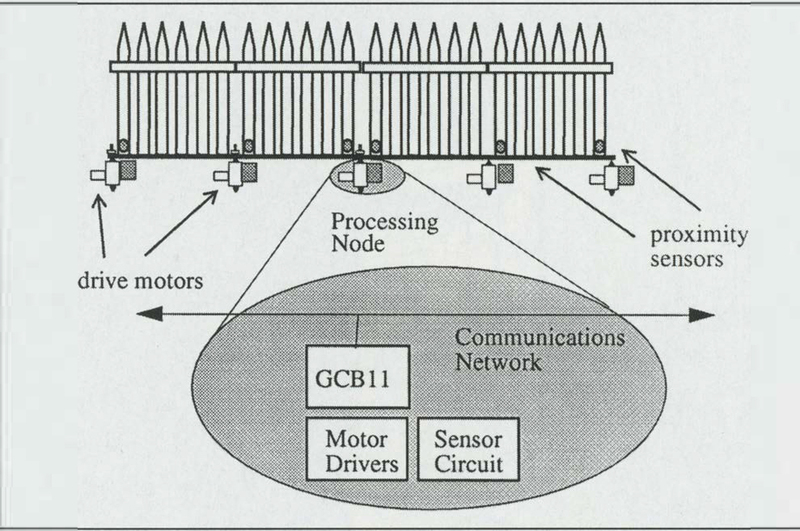 The coactive aesthetic exploits a secondary aspect of computers their ability to perform complex The Fence control tasks. This ability creates interactive environments or entities that exhibit intentions or desires in the viewer’s eyes. Humans are able to perceive intentionality of other entities only through interacting with them under a variety of conditions. ls an interactive art piece exhibiting the intentionality of the artist or of itself? Other questions such as “what makes a particular behavior intelligent or interesting (or beautiful)?” are also a guiding focus for the systems we create. By considering aesthetic in addition to scientific issues we are allowed a certain freedom in exploring all viewpoints and gaining unique insights. Our personal intuition is that the question of what makes a behavior intelligent will turn out to be largely a question of perception, and is thus closely related to aesthetics. As interactive art matures, a language of interaction will emerge. This language of interaction will reflect a deeper understanding of the dynamics of interaction between systems (e.g., art object and viewer). Furthermore, this language will necessarily tie together aspects of intelligent, intentional systems and issues of perception. The Fence is an actual picket fence approximately three feet high and 12 feet long. It is divided into hinged sections that enable it to move and undulate in response to people in the room. On one side the fence is pristine white while on the other it is covered with graffiti. At face value The Fence represents a boundary between two very different worlds. When the interactive aspects of The Fence are added it enables the viewer to experience concepts in a way that can only be alluded to (if at all) in other non-interactive mediums. A fence is a stationary entity. It represents an immutable boundary. Indeed the concept of boundary, that is, where does the “thing” end and the “other stuff” begin, is itself changing (e.g., entification is a central issue in theories of complex systems), making our age one of mutable boundaries. Boundaries in all aspects of our world are changing at an ever-increasing rate. The Fence is a representation of that reality. The Fence exhibits different behavior repertoires depending on with which side the viewer is interacting. This depicts in a dynamic way the dichotomy that exists on the two sides of a boundary. The Fence also can express complex relational and intentional notions such as”aggression” and “playfulness” simply through the physical behaviors exhibited in response to viewers’ actions. For example, The Fence singling out a viewer and moving to encircle him/her can be seen to express the notion of aggression or control (or safekeeping?). The Shy Fence moves away when the viewer approaches.